The roof is the uppermost part of a main building that functions as both an insulator and drainage system to enclose a space as well as protect it from the effects of weather elements such as rain, wind, sun, heat and snow. A good roof is an essential part of a home just as a safe foundation. Living in a humid climate, many homeowners can see dark streaks on their asphalt shingle roofs. A combination of dirt, defective shingles, mold, or mildew can spread through debris and airborne spores, giving your roof an unsightly look and a loss in longevity. What does a home owner need to know about their roof? Debris: Trim away any trees touching your roof to prevent algae from growing. Trees can drop leaves and pine needles that collect and create moisture. Rotting: Do not let your roof rot because it can become a serious issue. Debris such as fallen leaves, moss, and algae can cause your roof to retain water, which accelerates the rotting process. If left alone, rotten shingles will let moisture seep into the attic and cause leaks. Gutters: Clogged gutters can cause damage to your roof because water accumulation accelerates wear and encourages rot and mold growth. If the gutters become too heavy because of all the debris, they can actually be ripped from the side of your roof causing further damage. Humidity: If you live in an area known for humid climates, consider paying for roofing materials or techniques that resist fungi growth. Ventilation: Improve your ventilation system inside and out. For your roof, ridge vents provide the utmost aeration. How to spot problems: Look for wear around the chimney and the boots that surround the kitchen and bathroom ventilation tubes. Check for cracked or bad shingles, loose nails, leaks in the attic, etc. Algae: they like the dampness and shade, so algae spores can grow on wood shingles and asphalt shingles that are consistently in the shade. Due to roof Algae retaining so much moisture, it will cause shingles to deteriorate and eventually rot completely. Algae also like the humid conditions in gutters and downspouts and can grow there as well. Algae are recognized by their black-green coloring. Moss: It likes moisture, so it typically grows on moist wood shingles or shakes. 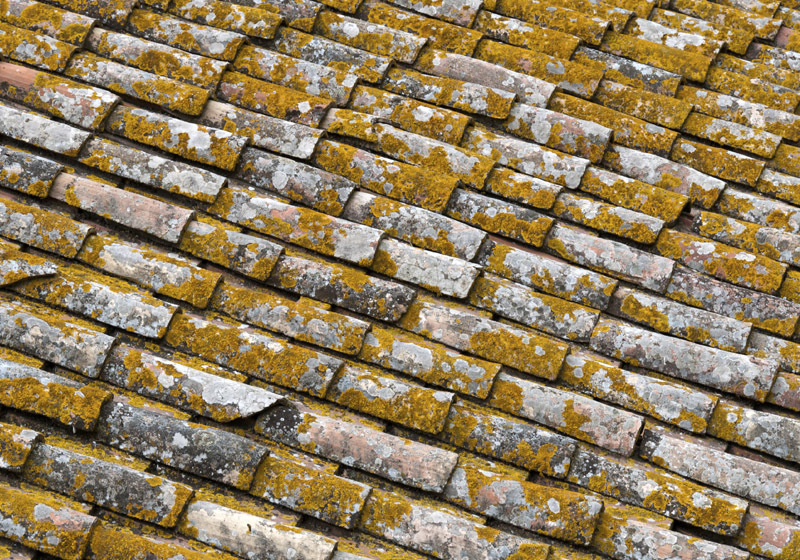 As the moss grows, it contains even more moisture, all resting on the surface of your roof. Eventually, your roofing materials begin to rot, compromising the integrity of it. Mold: Appearing as fuzzy black, brown, or green spots or slimy film, mold is attracted to damp or humid environments and spreads quickly. Black mold is the most dangerous type of mold. It lives on wood, paper and drywall, so if the problem is not addressed quickly, it could weaken the entire structure of a home or building. Easily recognizable by its dark black color and its strong musty smell, black mold is toxic and can cause serious respiratory illnesses in occupants of the home or building. Mildew: Recognized by its powdery consistency, mildew typically grows in warm, humid and rainy environments. It is most commonly found on roofs with poor drainage or where trees hang over the roof line. Green, black, red, or pink in color, mildew is a fast spreader. Proper care and maintenance is essential for the long-term performance of your roof. A roof inspection, especially after a storm, is a major component to proper roof maintenance. In the case that moisture and leakage of your roof does occur, Phoenix Clean can restore its original integrity and help to keep your expensive roof in great shape.